Our most challenging bike route to date is certainly one of superlatives. It includes one of the highest road passes in the UK, one of the longest steepest climbs and a downhill to match, all set in 360 degrees of incredible scenery. Find out how the Dahonies fared on the legendary road to Applecross. Time it took us: 4.5 hours, which is much less time than we thought – we must confess to pushing the bikes for some of the ascent, and stopping frequently to catch our breath and admire the views. We started with a pleasant ride from Shieldaig through woodland, then a few miles of climbing flanked by the magnificent Beinn Bhan. 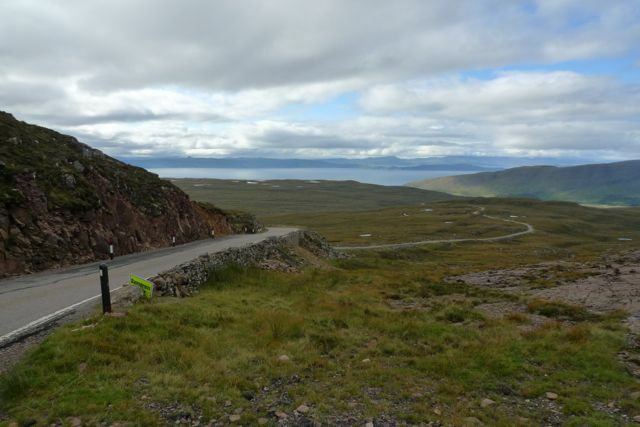 After that, an exhilarating downhill and undulating road took us to the start of the Bealach na Ba. Propelled by mounting anticipation, we trucked up the ‘easy’ lower section, and it wasn’t long before we caught our first glimpse of the Coire Na Ba. 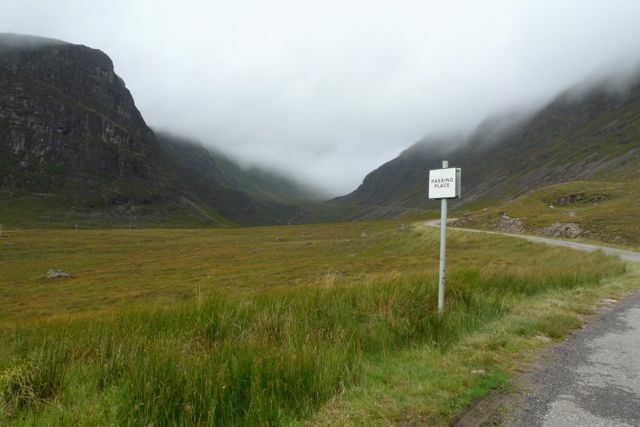 Guarded by formidable cliffs on either side, the road disappeared into cloud. Here the climb really began, and before long both Dahonies were compelled to travel on foot for short sections. The road becomes incredibly narrow and we had to give way to cars quite frequently, but luckily the drivers were very respectful with some even giving encouraging waves and thumbs up – the first (and probably the only) time we’ve ever experienced a sense of camaraderie with the motoring classes. The gradient lessened slightly at the spectacular series of hairpin bends, and finally we arrived at the barren and other-worldly landscape at the top of the Bealach na Ba. On a good day this is a fantastic viewpoint, but not that day. Surrounded by thick chilly mist, we lingered for only a moment before heading off to experience the the best downhill of our lives. We were very much looking forward to some delicious seafood at the Applecross Inn at the end of our journey. Sitting at one of the outside tables, we felt like minor celebrities as we were approached by a few people who had passed us on the way, and were curious about how we found our ride. We felt so proud at successfully completing the first leg of our journey, but little did we know, there was a much harder road to come. Terrain: Minor roads with many challenging hills, made especially so as we were still recovering from day one! Time it took us: 6.5 hours. At breakfast our fellow B&B guests were deliberating the relative merits of motorbike versus car touring, and bragging about engine sizes. 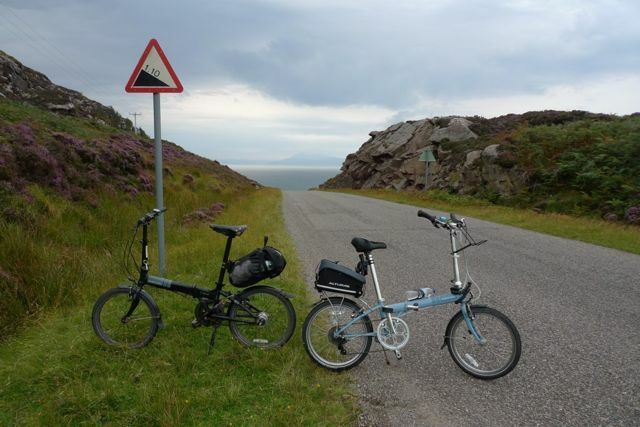 Indeed, the Bealach na Ba is popular for tourists using all modes of transport, but we silently wondered if motorists could possibly share the same sense of achievement that we had. We think not!!! Day two began with an easy cycle around Applecross Bay. We soon realised how tired our legs were as we hit the first of many uphills on this route, but luckily the wind was behind us all the way to the tip of the peninsula. To the right of us, abandoned crofts dotted the coastline against a backdrop of the jagged mountain peaks of Skye and Raasay. The road hugged the coast for a while, then moved inland over desolate moorland near Cuaig. Apart from occasional lochans and lots of sheep, there was nothing much at all. At Fearnmore, near the northwest tip of the Applecross Peninsula, we were greeted by a cluster of colossal Highland coos reclining along the road. Just around the bend, we got our first spectacular views over Loch Torridon and its surrounding mountains. After so many hilly miles, the undulating road was becoming hard work, and the enjoyment of the many downhills was tempered by always having the next uphill challenge in sight. The inland stretch from Kenmore felt particularly arduous, as we were beginning to feel very tired and hungry. Our reward came just beyond Loch na Creige, with a final, spectacular downhill that hugged the cliffs and thrilled with blind corners. Luckily there weren’t many cars, so we could slow down and enjoy the gorgeous panoramic views of the Torridon hills as we descended into Ardheslaig. We were hungry enough to have eaten clumps of dirt and were counting on some nice pub grub in Shieldaig, but sadly, the Tigh an Eilean Hotel wasn’t serving food until 6 p.m. So we packed the bikes back in the car and drove to the Torridon Inn Restaurant. Reassured by their ‘Muddy Boots Welcome’ sign, we chose a comfy couch in the corner and listened to other weary patrons telling tales of climbing in Torridon. Dogs sleeping by the hearth added to the cosy atmosphere. Reflecting on our adventure, both Dahonies were surprised at how much we’d achieved in the space of 2 days. It’s certainly going to be hard to top this Highland adventure, and now we just can’t help thinking, where on earth do we go from here? How to get there: Torridon is remote and not easily accessible by train, so for this trip we rented a car. It is possible to take the train to Strathcarron, if you don’t mind adding some very hilly miles to the start of your journey.